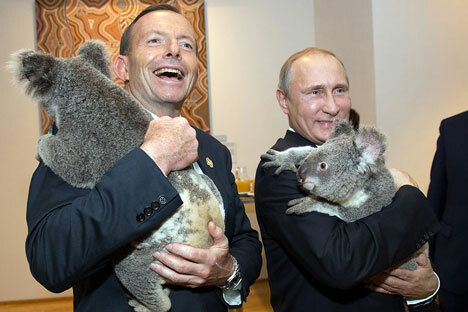 Australia's Prime Minister Tony Abbott and Russia's President Vladimir Putin as they meet Koalas before the start of the first G20, 2014. Moscow prefers the G20 format to the G8 because it better represents the line-up of forces in the international scene, Russian presidential spokesman Dmitry Peskov has told the media following German Foreign Minister Frank Walter Steinmeier’s remarks about the conditions on which Russia might be allowed to return to the G8 group. Among other things he mentioned progress in the settlement of the Ukrainian and Syrian crises. "The main consideration is Moscow is satisfied by the G20 format, which allows for having a better picture of the leading world economies’ reaction to the ongoing processes and which most fully reflects the line-up of forces and enables Russia to better display its potential in this format," Peskov said. He pointed out that Russia at the moment found the G20 format "absolutely satisfactory." About the outlook for settling the Ukrainian crisis Peskov said that "no progress is in sight at the moment and, as before, one can regret the lack of any movement forward by Kiev in implementing the Minsk Accords."